Sarah and Ruki Tipuna got married on the 15th June 2013. The couple wanted a relaxing day for themselves and their guests. They had an orange and purple theme that looked so striking. My most memorable moment was walking down the aisle and seeing Ruki waiting for me. I was extremely nervous before the ceremony as I normally don't like being the centre of attention. The actual ceremony itself is very blurry now and even the reception as well. I remember having an amazing time with my friends and family. Definitely the first thing I think of when I think back to the day is my husband waiting for me. As hard as it is, try not to stress. At the end of the day this is the happiest day of your life. Trust the people you have chosen to do their jobs. Sarah chose the Maggie Sottero, Florencia and bought her gown from our Wellington store. Sarah gave some wonderful feedback to our team in Wellington “The girls at Astra Bridal were so helpful. I have a couple of friends who have just got engaged and have recommended they go to Astra Bridal. I LOVE my wedding dress!” Thanks Sarah – the Wellington team all said what a fantastic bride you were! I only tried my gown on once which was about 3 weeks before my wedding day. I had found a picture of the dress online and loved it but I couldn't find anywhere in England who had that dress in stock. So I sent my Mum and my Maid of honour, Lia to Astra Bridal Wellington. Lia is roughly the same size as me so she tried on the dress while they skyped me in England from my Mum's Iphone. As soon as I saw it on Lia I knew that was my dress. So I had someone in England do my measurements and sent them to Astra Bridal. They ordered in the dress and then I tried it when I arrived in NZ not long before the wedding. It fit perfectly no alterations were needed. My Mum had been to a wedding expo and had seen some really nice dresses at the Astra Bridal section so she suggested I look on their website for inspiration. I saw a photo of Maggie Sottero's Florencia and immediately fell in love with it. This dress was just so me. It was almost a cross between my school ball dress and the dress I and worn for my graduation only more formal and in ivory. Mens Suits: Frank Casey, Tauranga provided the suits for the boys. They looked fantastic. 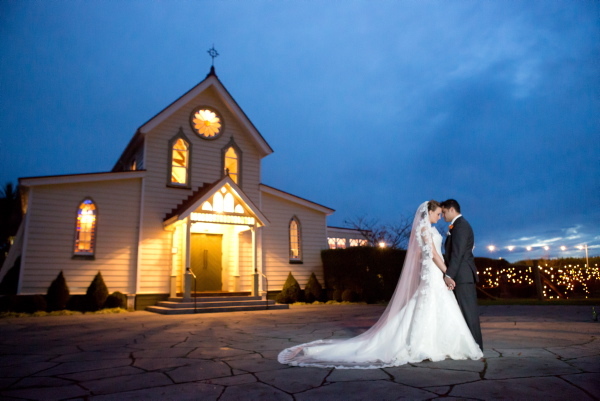 Location (Ceremony and Reception venue): The Old Church, Napier. This was the perfect place for a wedding. Such a beautiful location! The catering was done by The Old Church and the food was amazing! They took care of absolutely everything so it was also very stress free. I would not do one thing differently. The package included two nights’ accommodation in the villa, hair and make up for six people and breakfast on both days and a high tea lunch on the day of the ceremony while the girls were getting ready. Hair: Head High Hair Design, Hastings. My hair and make-up was included in the Pure Indulgence package that The Old Church offer. Both hairdressers and Candice who did the make-up did everything at the villa so we did not have to go anywhere. It could not have been any easier. Makeup: Embellish Me Mobile Makeup. Candice is so talented. People were commenting on how amazing my make-up looked all day. She was very easy to work with. Flowers: Lushka Flowers. As I am living in England we only discussed my flowers via email. I was adamant I wanted orange lilies but other than that I don't pretend to know anything about flowers. I sent a sample of the colour of my bridesmaids dresses to her. I saw my flowers for the first time on the day when Kim delivered them to the villa. They were perfect! Even better than I had imagined them. Entertainment: Left Hand Break travelled from Tauranga to perform at our wedding. They were excellent. Photography/videographer: Eva Bradley was the photographer. Eva was truly fantastic. I could not be more thrilled with the photos. She was also very easy to work with and a lot of fun on the day. I think Eva very good value for money as well in comparison to some other photographers. Celebrant: Karen Callaghan was the perfect choice for us. Neither of us are religious and we are not the type of people who express ourselves well with words. I didn't want an over the top ceremony just something that literally covered all the legal bits and wasn't really long and drawn out. However, Karen had options for all different kinds of ceremonies so if you did want something longer she would be more than able to accommodate that. Cake: Cindy's Cakes designed the cake. It looked and tasted incredible!